Cut a 12" long, 1 1/2" wide strip of the orange paper. Cut in half and this will be the base for two napkin rings. Cut a 12" long, 1" wide strip of the transparency paper. Cut this one in half as well. From here, you can make the more modern one, or the one with the ribbon. Modern: Wrap around and staple. All done! Ribbon: Set two eyelets about 1/4" inside of the ends. Tie with a coordinating ribbon. Done! These will make great, simple party decorations. 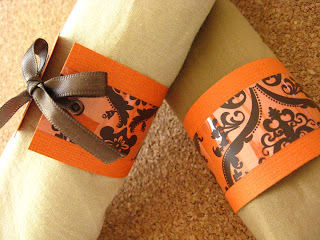 Use Halloween paper, or bold geometric paper for a birthday! If your napkins are patterned, try using a colored vellum... that way you get a little of the pattern showing through. Very cute idea!!! I need one of those eyelet puncher deals!!! I love it with the ribbon. :) Thanks!!! Great idea! I love customizable projects! I'll be linking to this in the Daily DIY. gorgeous! love your blog! i am all about fall / halloween decorating - really looking forward to more of your craftyness!